Roz as a Pushy Stage Mama in “Gypsy” Oh, yes! Who here has seen the movie “Gypsy”? 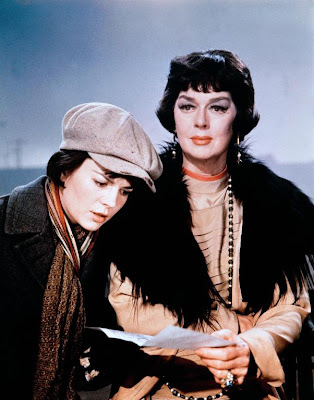 While it’s not always mentioned as one of Rosalind Russell’s most memorable performances, I personally think it is. As soon as Roz appeared in the movie, pushing her way through like a cannonball out of a chute, I was glued to the screen. 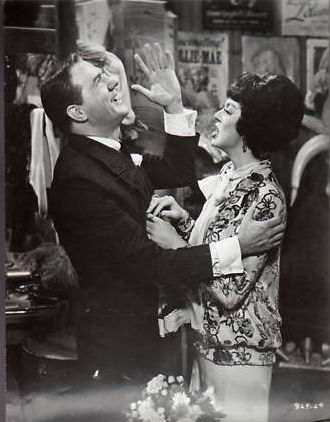 Playing Rose, the pushy stage mama of Gypsy Rose Lee, who later became a famous stripper, Roz played the part with so much gusto, it was hard not to be drawn to her character. 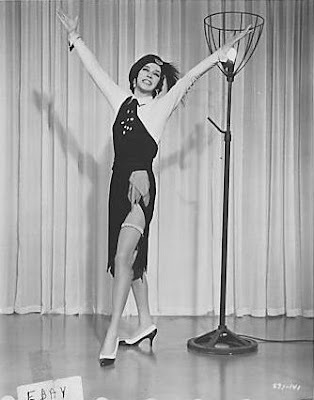 While I know the most famous characterization of this role was played by Ethel Merman on Broadway and Roz wasn’t exactly the best singer in the world, the acting was so much more important in my book. I am not sure how Ethel played the part onstage, but there is something about the way Rosalind gave her all to this part—so much enthusiasm, charm, and personality. You would probably be surprised to know that as soon as I saw this film (a few years ago on my birthday), it became my second favorite Rosalind Russell film. I know this is strange, when there is “His Girl Friday” to consider (among others), but the way Roz displays her huge personality through this role is amazing to me. Now to get away from my bias (which is so hard), let’s focus on the other players in this movie. 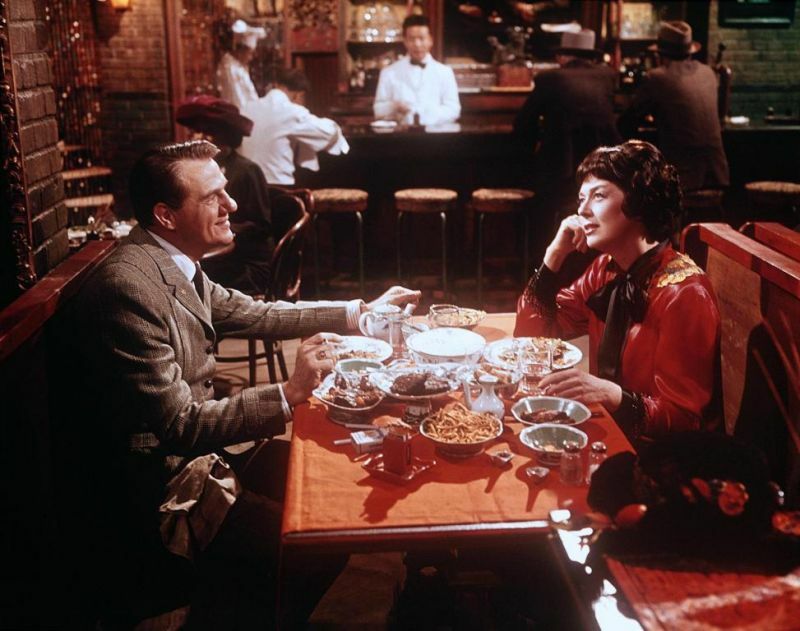 Natalie Wood, who had just filmed “West Side Story” the year before, was magnificent as Gypsy Rose Lee. At first, I was surprised to see her wearing such dumpy, plain clothes when she first appeared about 30 minutes into the movie. But in typical Natalie Wood fashion, she eventually became the glamorous actress we all know and love when she went from “Louise Hovick” to “Gypsy Rose Lee,” the stripper. Sometimes I wonder about the real working relationship between Natalie and Roz. I have heard some bad stories and I have heard some good ones. In my opinion, they were both huge stars, except Natalie was clearly on the rise and Roz was becoming one of those legendary stars from Hollywood’s Golden Age. 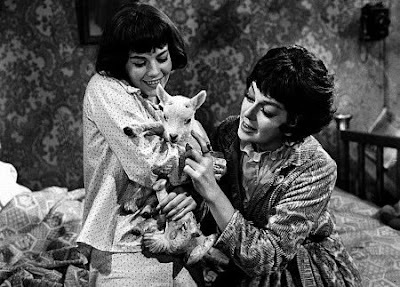 As for the actresses who played Baby June and Dainty June, I can clearly see that they were different types. Both talented in different ways, they did well in their parts. “Baby June” (Suzanne Cupito) was a magnificent dancer and could even do the splits, while “Dainty June” (Ann Jilliann) was a much better singer. In fact, to get critical here, when “Baby June” sang, I wanted her to get off the stage because her voice was so high and annoying to me. However, I believe that “Baby June” was probably supposed to sound like this because I have the soundtrack of the 2003 stage version of Gypsy, starring Bernadette Peters, and “Baby June” sounded like this. 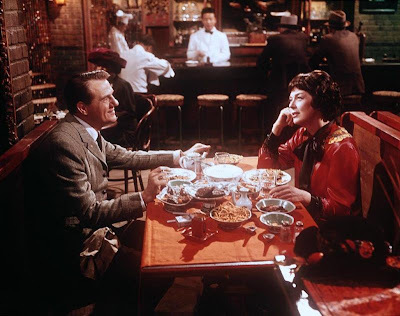 Karl Malden, who played Herbie, the long-suffering boyfriend of Mame Rose, was also well cast because he brought some real kindness to his role, which was needed because only a kind, patient man could possibly put up with Rose Hovick for so long! In the end, even though I am biased, the cast was a marvelous one, but Rosalind Russell is the true star of this film in every way. Mama Rose is supposed to be the star of “Gypsy” so I am not THAT prejudiced (haha). Even though people may be hesitant to watch it because Roz was not a singer and was dubbed in most of the songs (or sometimes for half of a song), please focus on her acting abilities. She certainly deserved her fifth Golden Globe for this role! Brava! Okay… I have to admit, this is my SECOND favorite Rosalind Russell movie (behind “Auntie Mame,” of course) because I love the way Roz interprets this character and although she may have had limited vocal abilities (although I do love the way they mixed the voices in the songs)… she was a marvelous actress and I love the great job she did in this film. I’m surprised she didn’t get nominated for an Oscar, although she did win the Golden Globe! “Gypsy” will be playing on TCM on October 28. 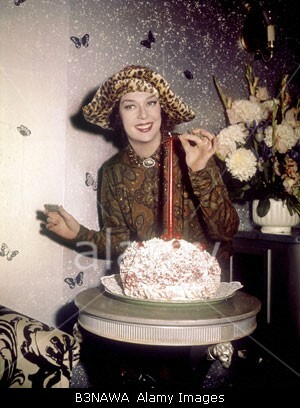 Sorry about the watermark, but I love this photo with the cake!